One of the real benefits of social media is connecting with people from around the world who we would otherwise not meet. I especially appreciate meeting individuals who are as committed as I am to helping small businesses create a customer experience that builds loyalty. This week’s guest post is from Adam Ramshaw based in Australia. Once you read his post, you will see Adam shares that commitment. Find out more about Adam at the end of his post. You may have heard the service mantra to “Underpromise and Overdeliver”. Read on to find out that practicing that mantra may not be the best way to get customers to return again and again. 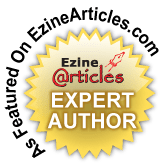 Many customer service gurus, and others, will tell you that you need to Wow your customers to drive great customer loyalty but recent research indicates it may not be the best approach. I’ve been saying for a while that you over delivering on your promises is probably a waste of time and certainly has a low return on investment. Now I have some solid scientific research to back me up. 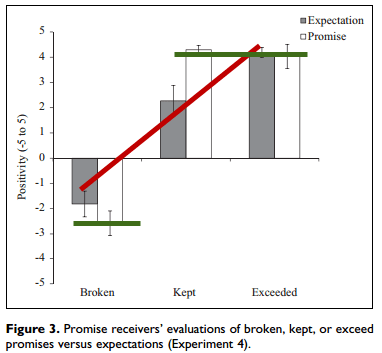 Worth Keeping but Not Exceeding: Asymmetric Consequences of Breaking Versus Exceeding Promises was published just a few months ago and examines the relative happiness of people when someone breaks a promise, keeps a promise and exceeds a promise. There were four experiments in this paper but we’re only going to examine two in detail. In this experiment participants used recalled promises that were broken, kept and exceeded. The researchers then linked the types of promise to how it made them feel. That happiness level was recalled at the time of the promise (Happy Then) and now (Happy Now). Not surprisingly, participants were unhappy with broken promises. However, the happiness level (if we can call it that) was very similar for kept and exceeded promises. 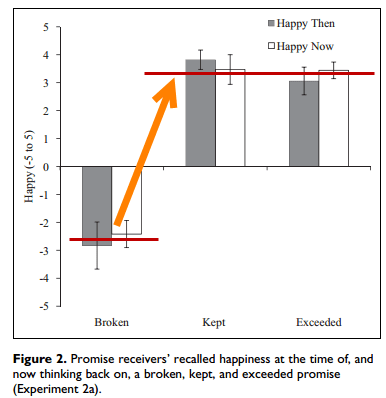 Further, the chart above almost shows that the happiness for an exceeded promise was statistically significantly lower than a kept promise. Customers like good news, they dislike bad new but they really hate surprises. It occurs to me that the results of this test may be evidence of the validity of this advice. Here the authors looked at the positivity of participants on an absolute scale (more is better) and with respect to the breaking/keeping/exceeding of a promise. Now things get even more interesting. When no promise was made and respondents had only their own expectations to test against, the absolute positivity of respondents was, more or less, linearly related to the value of the outcome. That is: the better the outcome the more positive they were. This is the red line on the chart. However, when a promise was pre-made about the level of delivery, the positivity was two sided: low if broken, high if kept or exceeded. See the green lines on the chart. It seems almost as if the promise changes the respondents view to a digital outcome: (broke promise) and (met or exceeded promise). The value of additional positivity from over delivering was lost (wasted?) if there was a promise provided. Indeed, existing research suggests that social systems tend to be hypersensitive to signals of dishonesty and unfairness but do not necessarily reward generosity. Put another way people are very sensitive to being ripped off but not so sensitive to any value you put on the table above and beyond your promise. 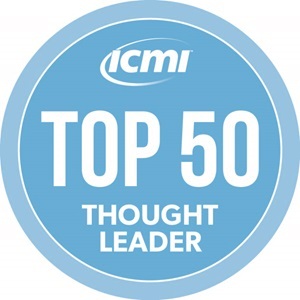 So how does this impact our businesses? 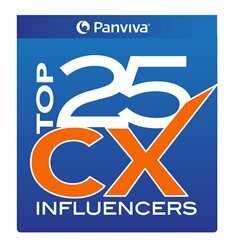 In our customer feedback work over the years we have seen that “do what you say you will do” is a consistent driver of customer loyalty. The higher a company scores on this measure, they higher is their loyalty. This academic research is consistent with this finding. So always keeps your promises. Don’t over Deliver on Your Promises. Once made, deliver on your promises but you don’t need to over deliver as that extra value will be wasted. The promise plays a key role in the positivity a customer will take away from their interaction with you. If you promise a customer a 10% discount and then give them a 15% you’ve wasted that extra 5%. However, if you simply give them a 15% discount without a prior promise or expectation you will get value for the whole 15%. So if you want to Wow your customers you should not set their expectations up front. 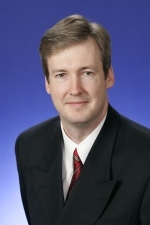 Adam Ramshaw owns a boutique customer feedback consulting company. With more than 15 years working in small business he knows the challenges it brings. RunOurSurvey is his answer to some of those challenges where you can download free Small Business Customer Feedback Resources to use in your business. Thank You for the information, I found it very valuable and will take a closer look to just how many promises I make on a regular basis. The study seems a bit flawed, since it relies so much on recall or hypothetical situations, but it does draw out an interesting topic for discussion. Experiment #3 in the study was the only one that used actual promises, but it yielded similar results. I think you’re definitely on to something! Rafael and Jeff — thanks for your comments. Jeff — I agree. Studies that use hypothetical situations are always a bit suspect but the data here seems to be pretty conclusive and matches with my real world business experience.